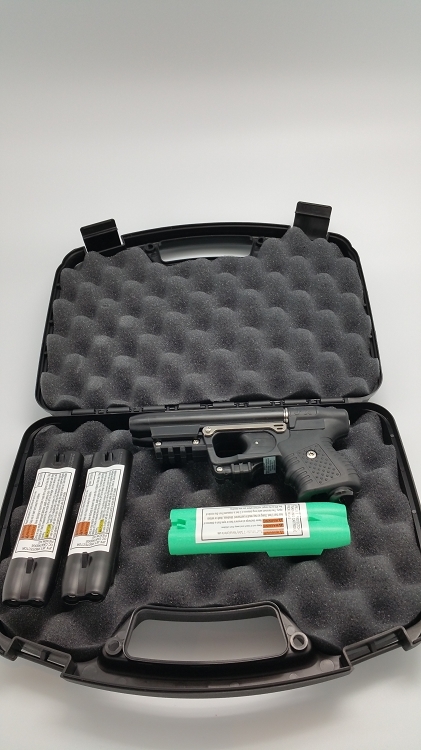 The JPX 2 represents a significant departure from conventional pepper spray designs. Most pepper sprays that come from a can are susceptible to heat and cold limitations and typically need to be shaken before use. These few seconds could mean a lot in a tense situation. Even more important, is that the canisters spray can be effected in a windy situation. If the wind is blowing in the wrong direction, using a canned pepper spray could cause you more harm then good. The JPX isn't effected like a canister in windy situations. It makes it a better and safer choice. The FIRESTORM JPX 2 LE Pepper Spray Gun has a patented propulsion system launches a high grade Oleoresin Capsicum pepper resin solution faster than a any pepper spray and up to half the speed of a bullet at 590 fps. OC oleoresion capsicum irritant agent and its effects in conjunction with Jet Protector Technology Oleoresin Capsicum (OC) is an extract of the cayenne pepper plant. OC is the most effective inflammatory agent available today, and is successfully used by law enforcement professionals around the world. OC has proven superior to both CS and CN tear gas when used against assailants under the influence of drugs or alcohol, as well as against psychotics. The inflammatory agent fired from the Jet Protector products is immediately effective upon contact with the face of an aggressor. The high velocity of the liquid jet as well as the inflammatory effects of the OC agent instantly interrupt forward movement. The OC works rapidly as an inflammatory agent to the eyes, mucous membranes and respiratory system. The result is temporary blindness, coughing and nausea with extreme discomfort. The eyes of the aggressor immediately shut, and the high velocity of the jet ensures that the agent will penetrate behind eye glasses, through cloth masks and other masks with eye openings. This temporary blindness leads to instant incapacitation and lasts for about 45-60 minutes. Symptoms will disappear, usually with no after-effects. The Jet Protector technology is a unique approach to enhance the performance of normal pepper sprays. The liquid OC irritant agent will be delivered much faster than aerosol, making it more reliable up to an extended range by means of a pyrotechnic power drive or primer. The pyrotechnic power drive is ignited by a mechanical firing pin acting upon a moveable piston, which causes the liquid agent to high pressure. The liquid agent is then forced through the nozzle, and emitted as a cone-shaped or aligned jet into the air at 590 FPS from the nozzel. If you are looking for an easy to use, non-lethal self defense product, the JPX 2 LE Pepper Spray Gun is your new best friend. Instantly incapacitates an assailant up to 23 feet. Most Law Enforcement operations with a firearm occur within 15 ft (5 meters). Warning: The MINIMUM safe discharge distance is 5 feet from the tip of the magazine to the target. Each owners manual describes specific safety protocols to follow. READ YOUR MANUAL BEFORE USING YOUR FIRESTORM JPX 2. Dimensions (L x H x W):	7.48 x 3.54 x 1.46 in. IF YOUR STATE HAS RESTRICTIVE GUN LAWS, THEN CONTACT YOUR LOCAL LAW ENFORCEMENT AGENCY FOR AN OPINION. SOME STATES DO IGNORE FEDERAL GUN LAWS and Firestorm or it's affiliates don't take responsibility for liability incurred due to state or local laws. NO SHIPMENTS TO NY STATE.